Previously on “A few days on Finnmarken” . . . 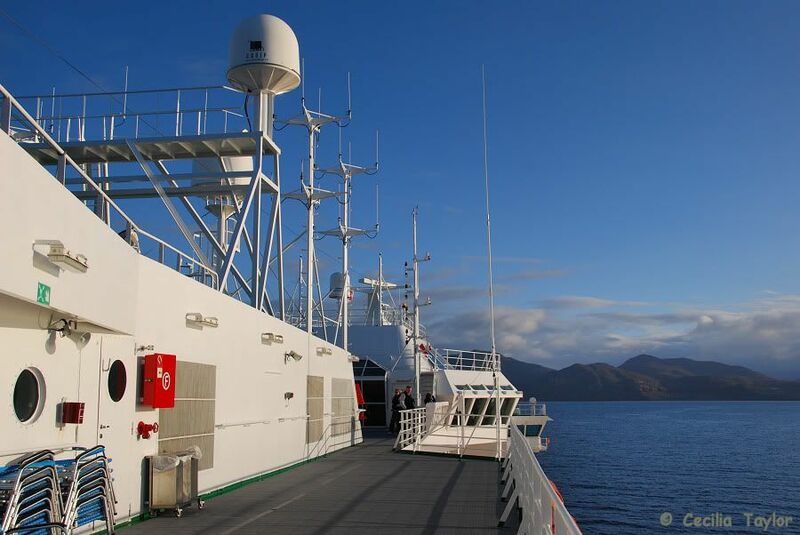 I began an account of a September holiday in Bergen and aboard the MS Finnmarken. The intention was for it to be in more “travel writing” style, which for me inevitably results in it taking a very long time indeed to produce! Indeed, by the end of the last episode, Seagull was only just about to board the ship! 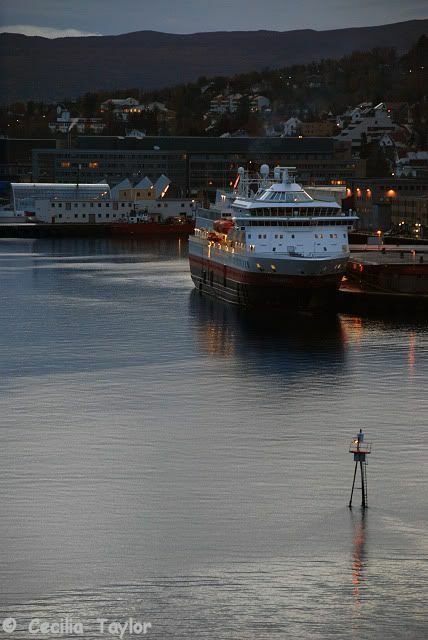 It all felt rather different because the new Hurtigruten Terminal had not been built the last time she embarked in Bergen – so it is perhaps an appropriate moment in the travelogue to be setting out from the slightly unfamiliar surroundings of this new Forum-home. Does anyone know the name of this guy on the image to the right?????????? Definitely Peter....and I think his surname was Jensen. Yes me too!!! Thanks to Sarnia, i read the thread all over again and it was so thrilling to read the comments of two friends i know now. As posted in the Finnmarken thread, i have a different opinion in the "ship ranking", but this opens up so much space to discuss!
. . . and the speech, supposedly scribbled on a strip of seaweed, was read out with such enthusiasm and apparent enjoyment that it was hard to believe this was anything other than the very first time! I was definitely impressed with the lively performance. 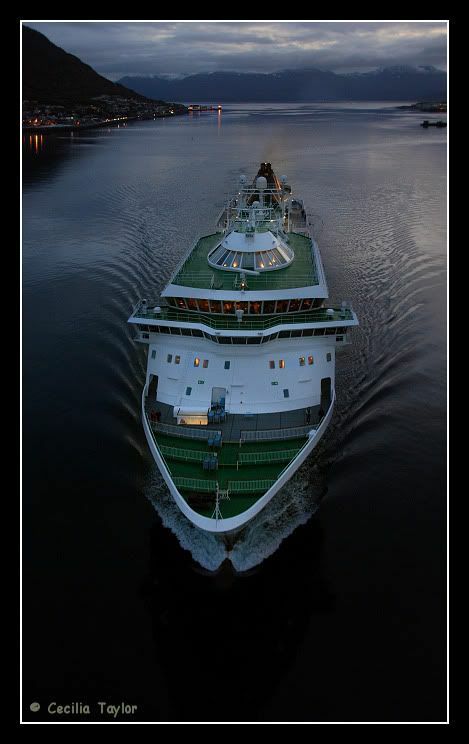 He has been the tour-guide on all my 3 trips/voyages with Finnmarken. And I have also met him on other ships. He is indeed my favourite. 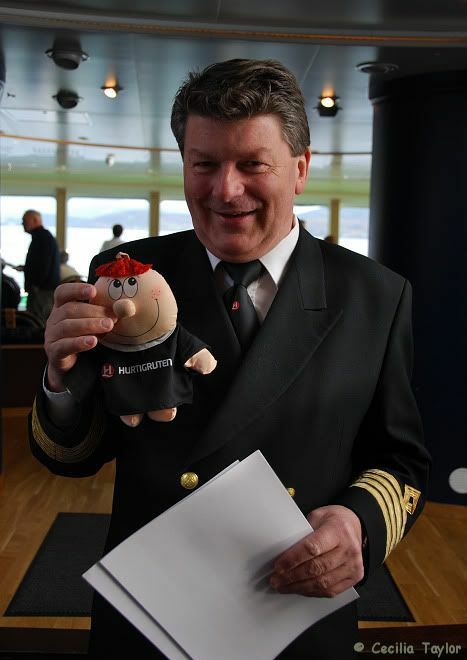 He is probably the FUNNIEST and most enthusiastic Tour-guide in the entire fleet. 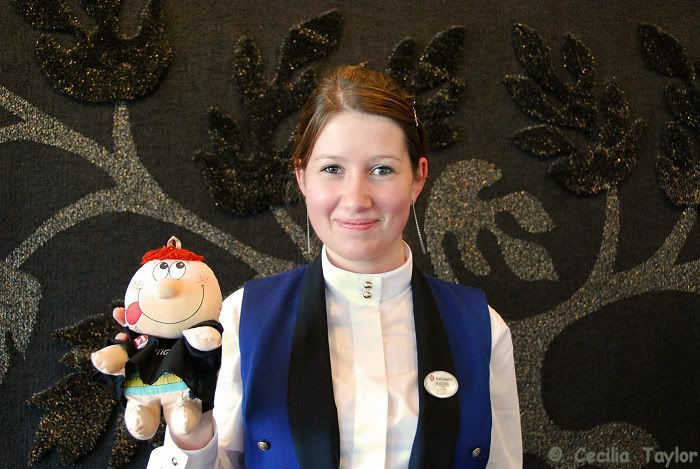 When I travelled with Finnmarken Bodø-Bergen some years ago, all of my trip was ONE big smile and a big laugh. So even if I was only a distance-passenger and was not a part of any groups, I joined both the english-speakers and the german-speakers every time he invited those groups to a meeting for info. I understand german very well. And even if the english "class" was funny, he went totaly "crazy" in the german "class". 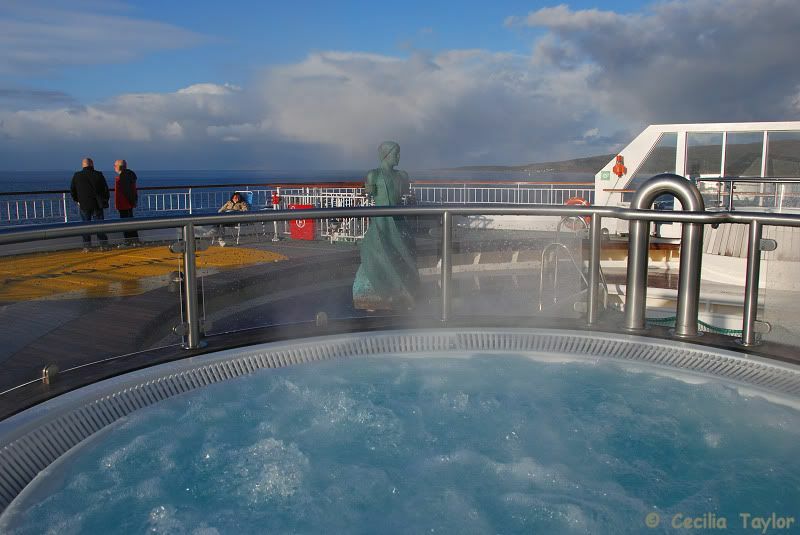 I have NEVER laughed so much aboard Hurtigruten any time. Last edited by HurtigruteMartin; January 9th, 2013, 23:06. And I am very greatful to you, Sarnia, that you did that. What an indeed wise thing to do. 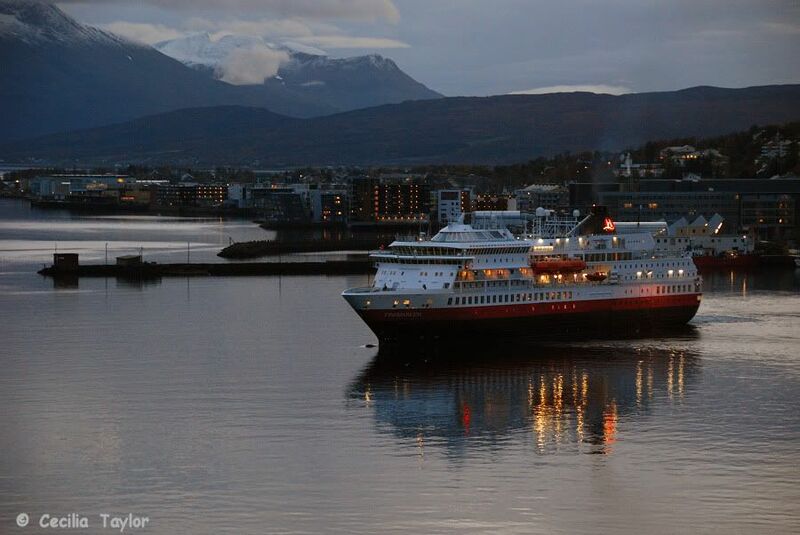 There are so many threads on our wonderful forum that passes my attention......... How wonderful to read all the posts and look at all these wonderful photos just a few days after my own small Trondheim-Bodø-trip with Finnmarken. I will bump this thread on top of the list again since Seagull has pointed me to it, in the "Finnmarken" thread. Do I need to say how much I enjoyed this travelogue, both in pictures and in words? If you have read it, you know what I mean. If you haven't, well this is your chance also! Thank you so much Cecilia for bringing it to my attention. Adding a comment so that this thread appears at the top of the 'New Posts' list - so those newer members like me that haven't seen it before can enjoy it. Cecilia - thanks for pointing us to this one - it's delightful. 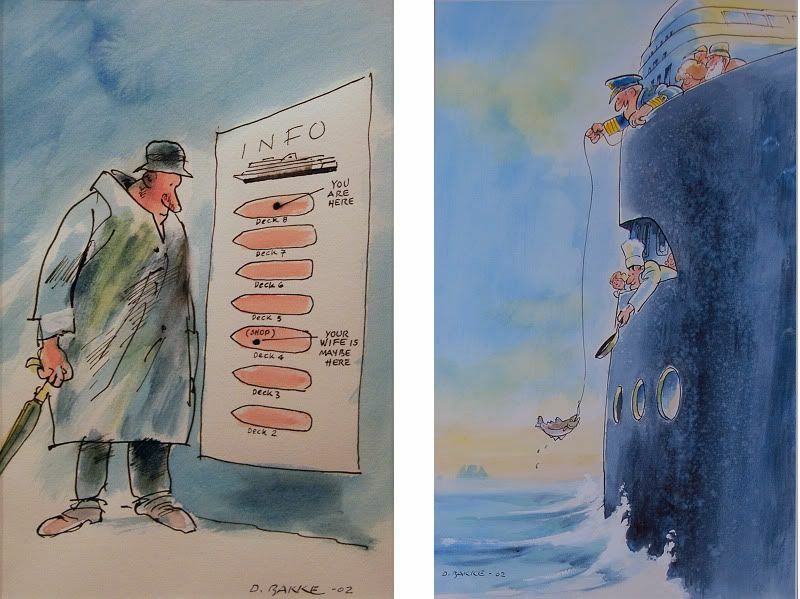 I also love those Dagfinn Bakke cartoons - they're so Hurtigruten!! Not much to add to J-O's comment. Thank you so much! I enjoyed that. 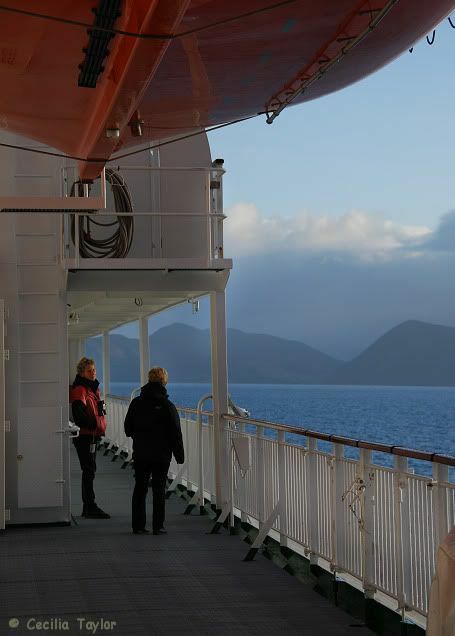 You expressed a lot of my own feelings being aboard a Hurtigruten ship - the fascination of being "on the road" at Highway no.1 along Norways coast, one of the most beautiful areas of the world. Well... Seagull... what can I say.. where shall I start with you? Your stories and images are absolutely amazing... I love reading every single word of them, and your images are truly wonderful. Can't wait for your next input..... Thank you so very very much for taking me on this trip! 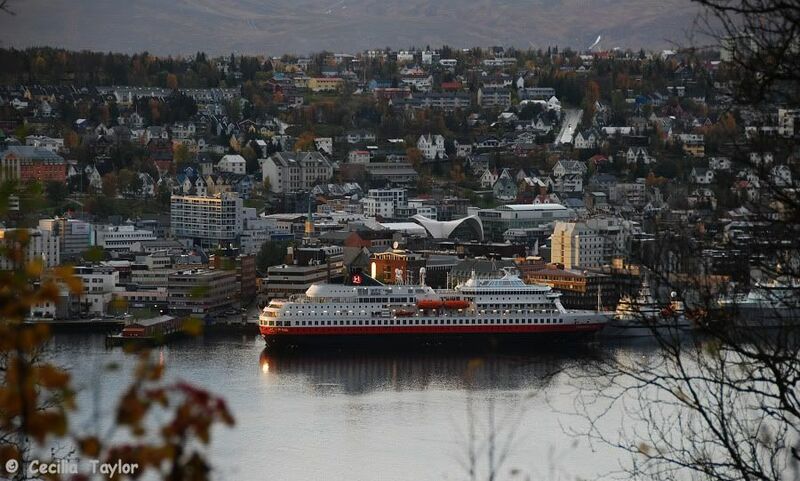 After checking in at my nearby overnight accommodation, hanging around the square for the “caught-on-webcam” ritual, and taking a few photos on the theme of Tromsø in Autumn, it was time to decide on a final photo of Finnmarken. Had I realised that the cable car was operating still – actually this was the last day of the season – that route to a view might have tempted me, but I am not at all disappointed that I didn’t rush over there in time to do this. For just beyond the bottom station, I noticed a couple of joggers emerging from the trees, and so discovered a path - Tipå Topp. It was beautiful there as I wandered along among the birches, the colours of the season and the late afternoon light suiting my reflective mood. My Few Days on Finnmarken had certainly been special, though not always in quite the way I had anticipated. 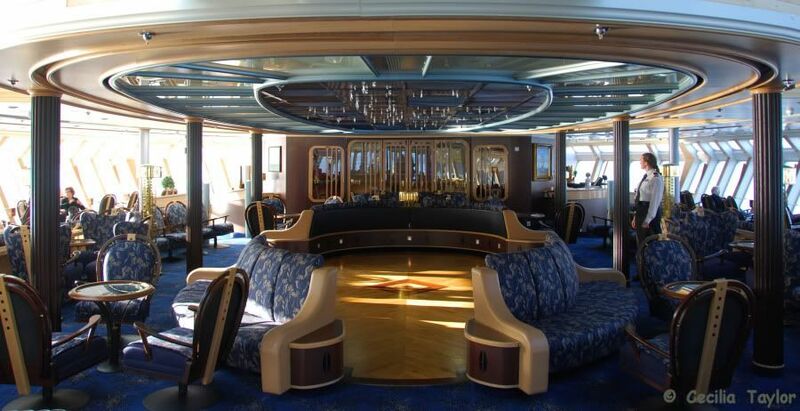 I had expected to be delighted and inspired by the ship’s interior and decor, but she was far from becoming favourite ship. I had expected to be irritated by demanding tourists that I thought would be attracted to “cruising” aboard such a ship, but had found many of the Americans to be the equal of the wonderful German enthusiasts of wintertime on traditional ones. I had expected to enjoy keeping myself to myself most of the time, but it had been rather a social few days. I had expected a tourist-culture to totally dominate, but had been captivated by the kaleidoscope of Norwegian life that had unfolded. 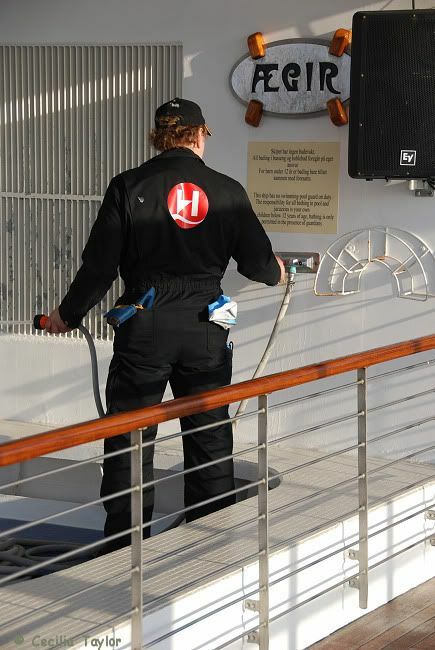 But now that I’ve been on all the ships – got the t-shirts so to speak (and sometimes literally) – have I “done” Hurtigruten ? No, no of course not, of course I haven’t . 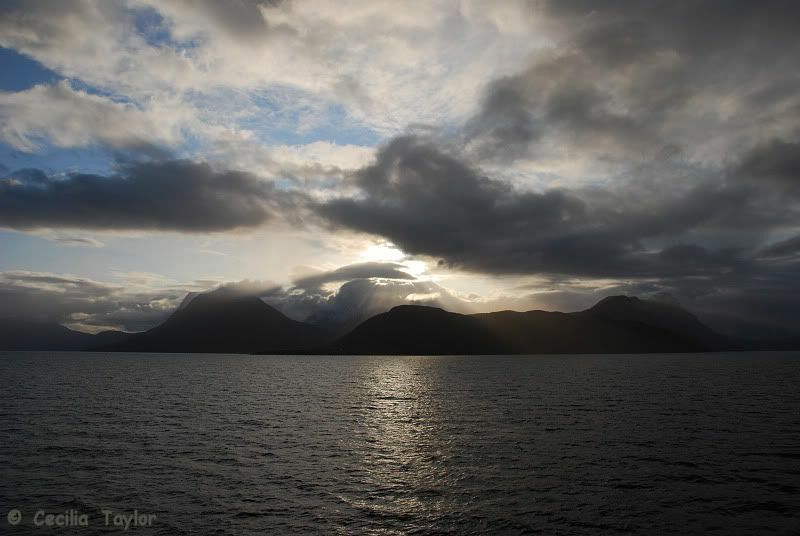 . .
Just then as I was already contemplating my next voyage along Norway’s coast, a gap in the trees framed a view of Finnmarken across the water, the curve of that rounded stern shining in the setting sun. 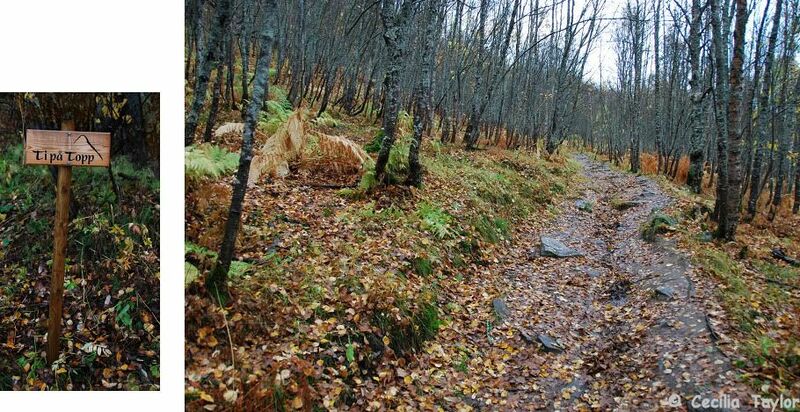 I turned and retraced my steps along the path, for I had an appointment - a final farewell for Finnmarken. So the story ends at the highest point of the bridge, where I’m standing, waiting . . . It seems to be growing dark so quickly, far too quickly - I can see there are lights on the working deck, but it’s hard to make out the mooring lines . . . ah, there they go now, and look, she’s starting to slowly pull away from the quay, gradually turning . . . how bright the H in its circle looks, the red reflection in the water . . . and now here she comes, straight ahead for the bridge, and what has seemed so slow now seems so fast . . . perception of speed and of the passage of time changing as she glides beneath me and finally from view. After my “baptism” and just as I was about to pick up my drink, several people asked to be photographed with the Captain, and it was then that an absolutely silly idea struck me. It was scarcely a conscious decision – I simply found myself introducing the Captain to the smallest and most junior member of his crew, though one with the experience of so many ships, who had been to Antarctica aboard Nordnorge, and even on Fram’s maiden voyage with another trip to follow! The tourists were captivated and egged me on. 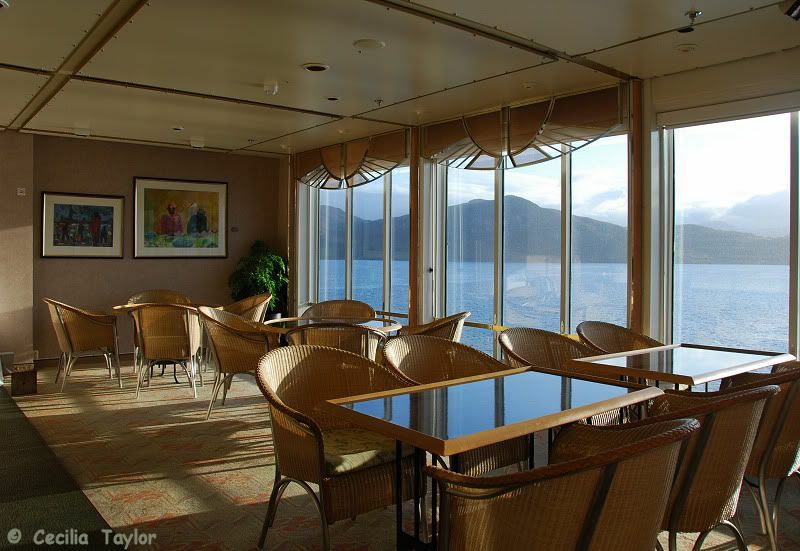 By the time I reached my destination, Sea-Troll had met many more of the crew in cafe, cabin, bar, and restaurant. Looking back on it now, this apparently silly and mad mood could, just about, be justified if you recollect the discussions on CaptainsVoyage about staff attitudes to passengers on one of the ships. Perhaps Sea-Troll could have a future in staff recruitment! – well, think about it – when an eccentric passenger comes up to you and asks if you might hold this mascot-troll-thing and get photographed . 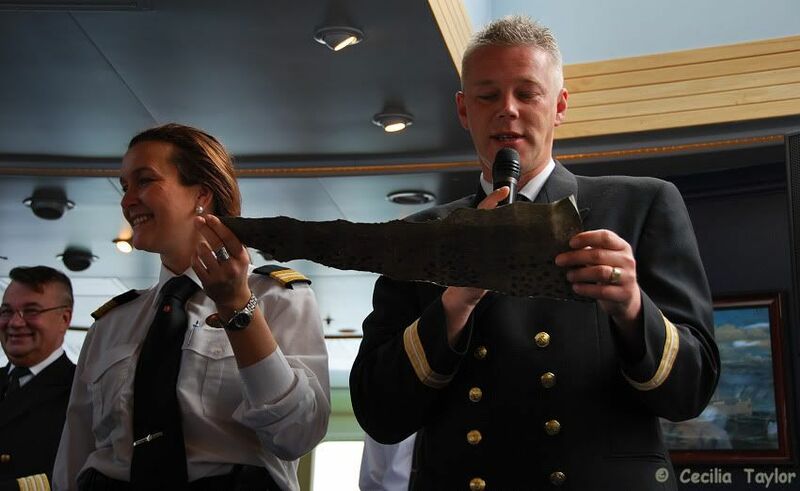 . . and you manage to do this and keep polite and SMILING, then clearly you have prospects in the new customer-oriented Hurtigruten. I can confidently report that the crew of Finnmarken passed the troll-test triumphantly! 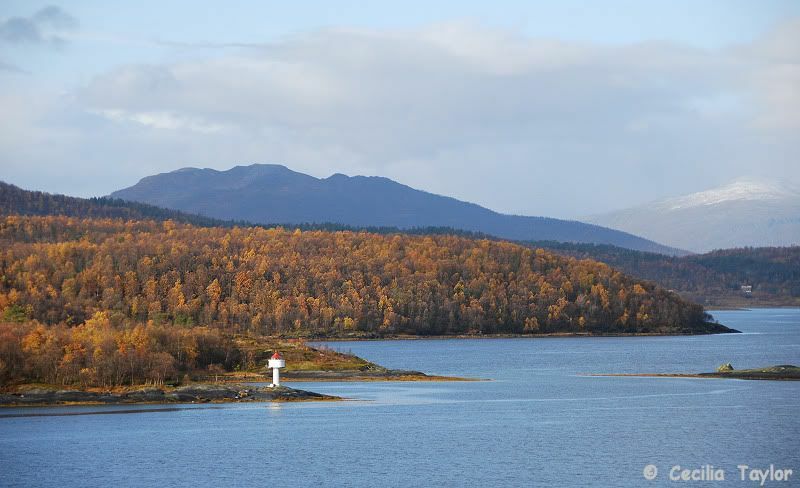 A couple of sudden rain showers as we approached Finnsnes only served to emphasise the glorious colours of autumn (though, as I was to see by following webcams and weather satellite images back at home, the sun was to return for the rest of that round-trip). Having helpfully been allowed to keep my cabin right through to arrival in Tromsø, I decided to take lunch early in the restaurant before packing. Unusually for the lunch free-seating buffet, a number of tables had reserved signs. 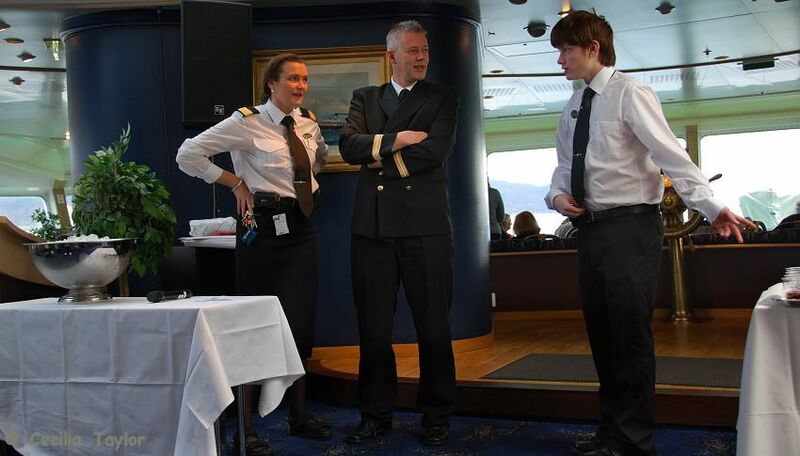 This turned out to be for a group I had already encountered who were holding a conference on board the ship. It’s easy to spot academics (takes one to know one I suppose, having ended my own career by returning from industry to a university environment). This conference crowd turned out to be from the University of Tromsø, and their subject was cell biology. It’s not a discipline I know anything about, though I was certainly aware of Edinburgh’s reputation in the subject, having had contact with many biology students taking courses in geology – palaeontology especially. I enjoyed chatting with the Tromsø crowd, who had generally tended to congregate up in the panorama lounge in the late evening, the tourists mostly staying down in Fløybaren following after-dinner coffee. But I don’t think I was the only one to mix and mingle. Along by the seats in the arcade, Peter, he of Neptune’s speech, was also chatting – to a lady who, he had already explained, was his mother who happened to be travelling on board. I had been thinking that Peter looked just a little like the Formula 1 racing driver Mika Hakkinen, at least from certain angles. I smiled at his mother, not sure how much English she understood, but nevertheless commented how proud she must be of her son working aboard a Hurtigrute. After all, only eleven people in the whole world had exactly the same job as his. This was immediately corrected to twenty two, taking into account two crew shifts – and that realisation really made me laugh as that’s the same number of Formula 1 racing drivers there are (or were at that time of eleven teams). Peter was of the opinion that no one in Norway was at all interested in F1, which was why Michael Schumacher took skiing holidays there where he would not be mobbed by fans. I asked about rally driving, thinking of the Solberg brothers, and was about to discuss various spellings of the name Peter/Petter when he was called back to the excursions desk in connection with last minute excursion bookings. 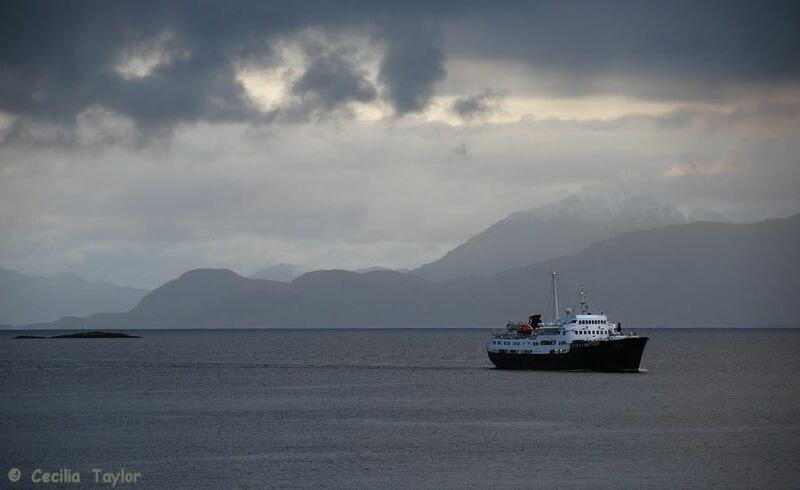 And so my last few hours on Finnmarken passed pleasantly, though all too quickly, rushing around for last photo opportunities and goodbyes, and then, suddenly it seemed, I was disembarking in Tromsø. It was only when a table set with small glasses appeared that I realised what that something might be. 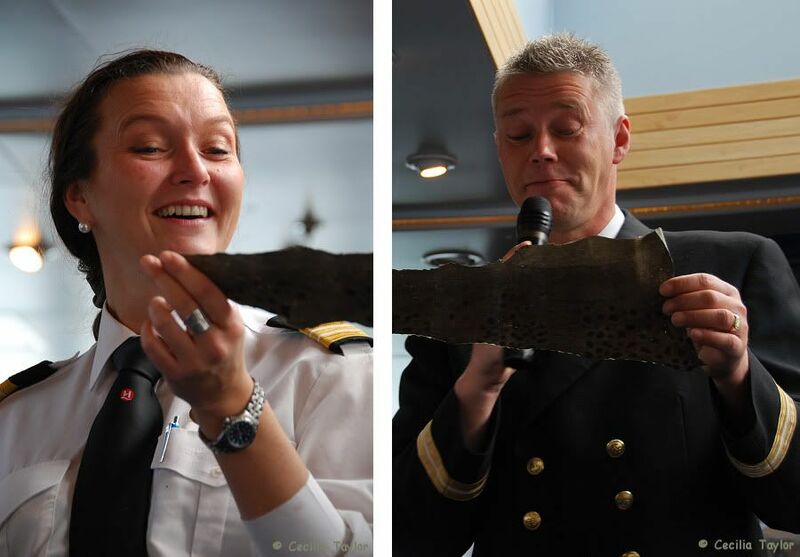 Of course – the Neptune Ceremony! That was when an idea occurred to me – and I will put the blame for what followed entirely on CaptainsVoyage and the delightful thread of Lookchin, the bear who gets photographed in such interesting circumstances and places. So I returned to my cabin to collect my mascot Sea-Troll! Not that he is even remotely as photogenic as Lookchin (nor I as talented as that bear’s photographer), but I somehow fancied a photo of the troll looking as if he would like, or had perhaps already consumed, the Nordkapp Wine that was being poured out. I was still fiddling around with troll and camera and hoping no one was watching me when a whole influx of tourists suddenly materialised. Hastily stuffing Sea-Troll into my rucksack, I was about to head off . . . but it was already too late. My exit was blocked as they swarmed around, rearranging chairs so as to get the best view of the proceedings. There was no getting out of it, so I did join my American friends and thought I’d even take advantage of the front seat and amuse myself by taking some photographs. Already everything was in place . . .
. . . Neptune had arrived (as had the Captain) . . .
Then the tourists were invited to form a queue to approach Neptune himself, and having been baptised with an ice cube down the back of the neck, they moved on to be presented with their Crossing the Arctic Circle certificate by the Captain, and be rewarded with the aforementioned drink. My companions had staggered their timing so as to be able to photograph each other, so it was a while before they realised that I had remained a spectator. Then they encouraged me to participate, ignoring my protestations that it was all “just for the tourists groups” or that I had crossed the circle many times previously and was well known to Neptune! Unlike my first certificate from Trollfjord in 2003, clearly these certificates were not personalised – there was a line to enter ones own name – and I had observed that there was no shortage of certificates, the queue having eventually diminished. So why not indeed! This was after all a special voyage for me, having now sailed on all the current fleet – it would not be inappropriate to celebrate such an achievement, and what better souvenir in the absence of a certificate specific to the circumstances. The sudden transformation in the weather struck everyone as remarkable. Passengers raised the blinds and pressed their noses against the deck 5 cabin windows, others ventured outside, rubbing their eyes in the unaccustomed brightness. I swear I could hear one man humming the Beatles classic Here comes the Sun under his breath. Certainly everyone was smiling. I had headed higher to take some photos of the now more aptly named sun-deck. Already the first blue chair was out and occupied – freed from the stacks which had been securely tethered for days. Another area was being hosed down, for surely the jaccuzi would soon prove popular. Not that the sky was entirely blue other than directly overhead, for cloud and mist remained along the horizon where distant rain showers rendered rainbows. No great arches these, rather a ribbon which had been cut into little pieces. Indoors I continued to take a few photos in these transformed lighting conditions. Babettes Cafe looked inviting in the sunlight, but remained as deserted as ever. 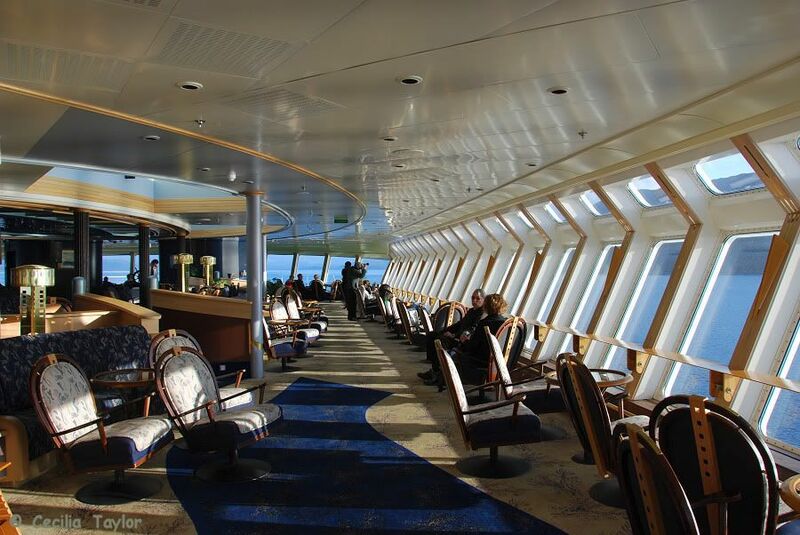 I wandered through Stiftsstaden and up a deck to the panorama lounge, remembering that earlier I had not taken a satisfactory photo of the central area due to the entertainment then taking place. Perhaps I had only just arrived in time now, for a crew member was hovering around looking distinctly as if she was about to make arrangements for something or other. Next morning dawned damp and dark beneath low cloud, although it was not actually raining. Nevertheless I felt more inclined to watch activities from the deck, rather than going ashore, now that the restrictions around the promenade had been lifted. 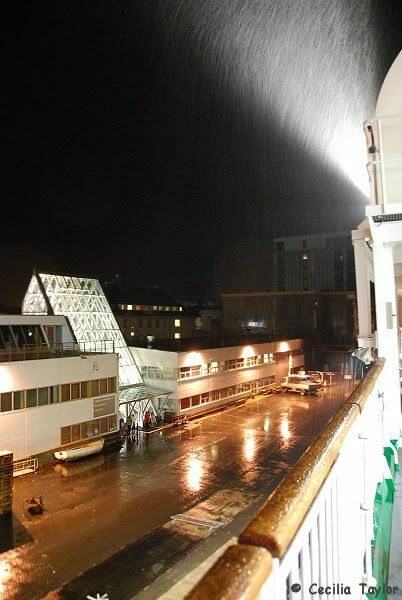 That would in any case be the ideal place to look out for the southbound ship Lofoten. I had even recommended this pursuit to a number of people, stressing the opportunity to see a traditional ship, and keeping them from their breakfast. 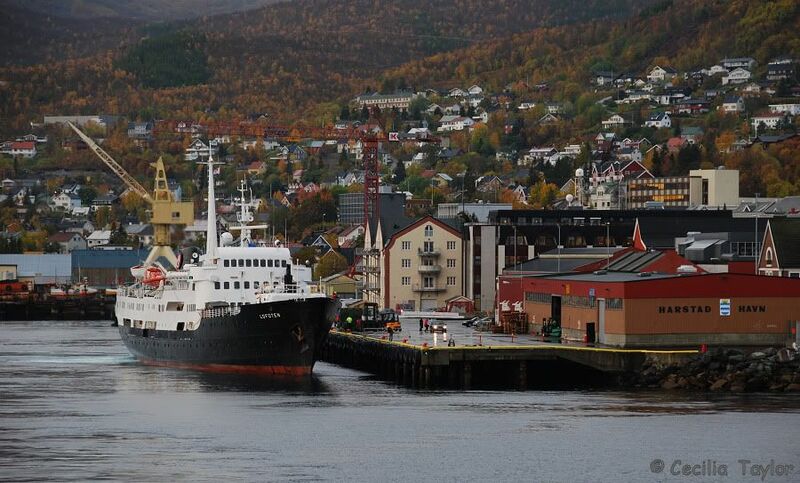 So time passed and as Finnmarken’s cargo loading doors slammed shut, emphasising the imminence of our departure, I began to think the chance of seeing Lofoten had dwindled, along with my reputation. Then suddenly there she was in the distance, hastening towards us, and as if performing a graceful waltz turned to dock as we acknowledged her and swung away. 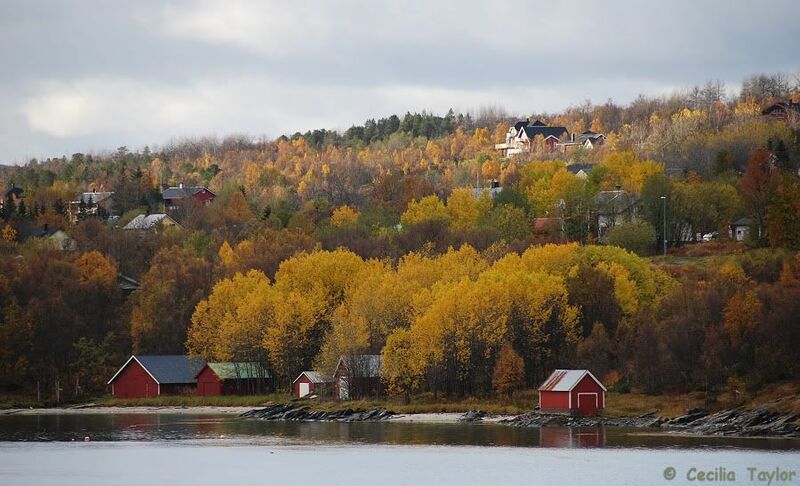 The autumn colours were compensating for the cloud, and I stood staring at the view until well after Trondenes church had finally disappeared from sight before succumbing to the lure of the cafe and coffee. Returning outside half an hour later the sun was just managing to make its mark as faint reflections in the water, though curiously I remember feeling the mood was more like a sunset than a sunrise. But sunrise it surely was, for, as the clouds swept across the sky and the ship scurried along in the opposite direction, it seemed that we emerged to a clear blue sky in an instant. 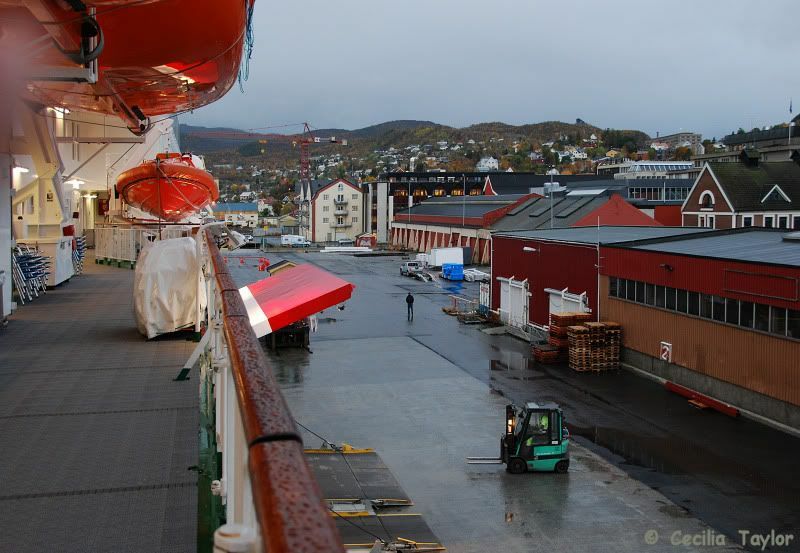 Hurtigrute webcams had revealed tantalising glimpses of building construction taking place in Svolvær since my last visit, but, hurrying back from the art gallery in absolutely torrential rain, it had been difficult to fully appreciate these changes. Back aboard Finnmarken I attempted a photo of the glass entrance to the new terminal building, but as soon as the ship left the harbour I headed for my cabin. 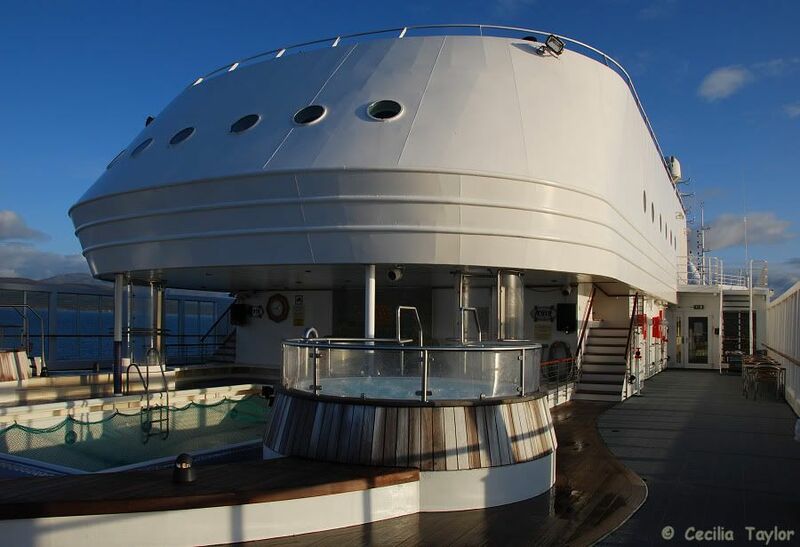 Now I’m dry once more, it is perhaps a good moment for me to take you to see a favourite part of the ship – and you may initially think it a curious choice – the aft stair! 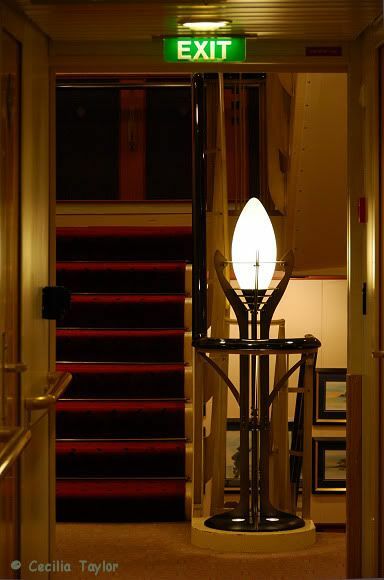 I hung around those stairs rather a lot during the voyage, getting in everyone’s way and generally making a nuisance of myself. Occasionally the impedance may have encouraged others to linger and look at what I was looking at, enjoy what I was enjoying, but when meal times approached most folk seemed intent on scurrying down – even if they did then have to stand around in the arcade for the restaurant doors to be opened. But at other times I was not the only admirer of the art of Dagfinn Bakke which adorns these stair landings, and it was really no surprise that the visit to his art gallery in Svolvær had proved so popular. 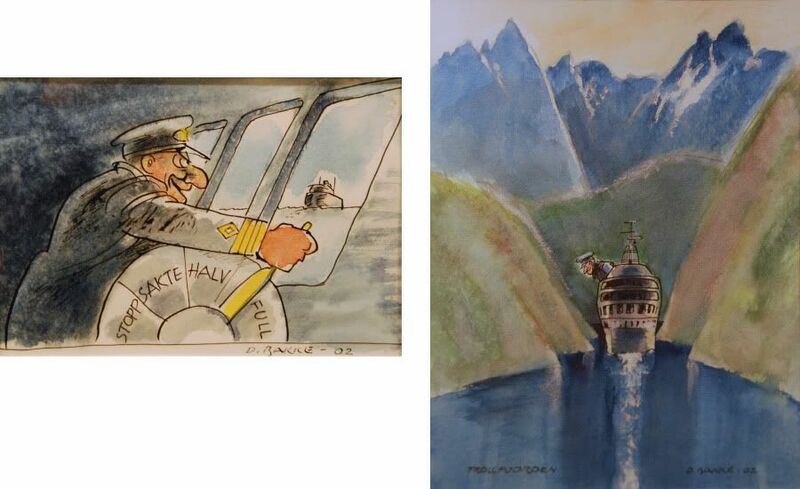 The artworks on Finnmarken’s staircase are humorous illustrations – caricatures or cartoons you could call them. 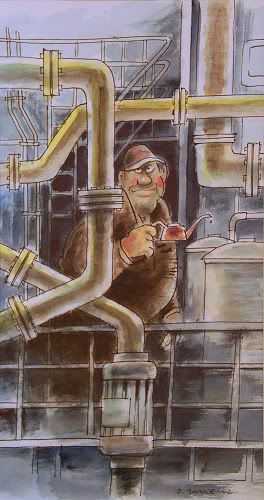 They reveal a keen observer of people and situations – a whole cast of characters and local types are portrayed here with the gentlest of jest. So difficult to choose a favourite, though I kept coming back to this engineer . . .
. . . selected some to photograph especially for Jan-Olav . . .
. . . and there were those with me in them! 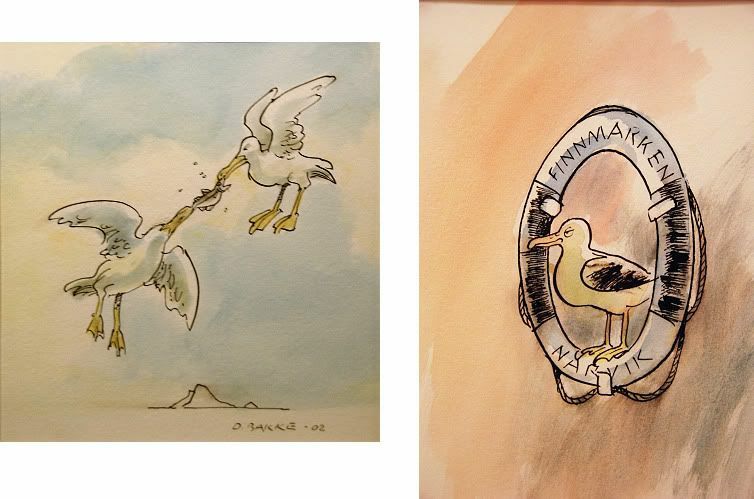 – the one on the right could indeed be the illustration for my entire story of A few days on Finnmarken.